Yes, that’s right: I made Pickled Grapes Benedict. How did this come about, you ask? Well, the Shaker cook book from which I got the grape recipe mentioned that they’re amazing with pork. I was in a hurry this morning, but my local bodega (New Yorkers call corner groceries “bodegas”) had some Canadian bacon, and my mind started heading brunch-ward. I was also thinking that the brining liquid from the grapes reminded me a little of the Italian grape must condiment saba. When I started poking around for saba-based recipes, I came across this one at Epicurious for Saba Sabayon. Sabayon, I thought, could be substituted for Holandaise. And thus “Pickled Grapes Benedict” were born. To actually make this dish, I took Gina DePalma’s Zabaione recipe from the Babbo site, omitted the sugar, and halved the liquid (and, of course, used brining juice instead of wine). Toasted up an English muffin, fried up some bacon, dolloped on the zabaione and grapes, and…Voila! I must say, this dish looks a little crazy, but it was absolutely amazing: the grapes are tangy, cinnamon-clove spiced, and a little sweet. The zabaione cuts their acidity nicely, and then it all bumps up against the bacon. Delicious! Though next time I want to put it on homemade biscuits. This day is just going uphill, because I have something happy to post: the lovely Elyse at The Cultural Dish was kind enough to give me my first Stylish Blogger award! Totally made my day! I gather the thing to do is give 7 facts and pass on the love, so here goes. 1. I once applied to grad school for costume design. 2. I probably would be a cat person, but I’m deathly allergic. 3. I can no longer sleep well when I go home to Providence/Boston because I miss the sound of New York traffic. 4. During my college archaeology major days I spent a summer digging in Pompeii. 5. While digging in Pompeii I saw Kim Catrall and she was faaaabulous: I actually noticed her dress before I realized who she was. 6. I’m part Welsh. Sadly I did not get the family red hair. I was wondering what you were going to do with these pickled grapes! Pickled grapes benedicts??? That is just awesome! Looks absolutely beautiful and seems so refreshing. I have to try this soon! I have been waiting to see what you would make with those grapes. So tell me, are they yummy? This looks so incredible! Congrats on the award! I have never heard of pickled grapes before!! Interesting! I bet they’d taste pretty awesome too.. I made pickled grapes on a whim last summer, and so far I’ve only used them to spice up chicken salad sandwiche or as a cheese plate garnish. This sounds pretty delicious, though… the savoury sabayon alone would be worth it! BTW – That comment about Simon and Garfunkel makes me ever so grateful (again) that my name has never been in the chorus of a popular song. 🙂 As it is, I get a little stabby every time I’m introduced to someone and they respond with “Is a bell necessary on a bicycle?”. Stabby, I tells ya. Hey, that’s for the shout out! Glad you like the site. First of all, pickled grapes? Brilliant. I’ve got to try this! Second, thanks for the shoutout! I loved reading your fun facts. Pompeii is so cool, I got lost there with boyfriend one vacation! Thank you!!! Can I pass it on back to you because I looooove reading your blog! I have a grape vine and we have pickled grapes every winter … we eat them straight out of the jar, or with a side of aged cheese…mmmm. If I have a jar left, I will copy your creation. I like the sound of eggs with the grapes. and can i just say, you are such a daring cook! 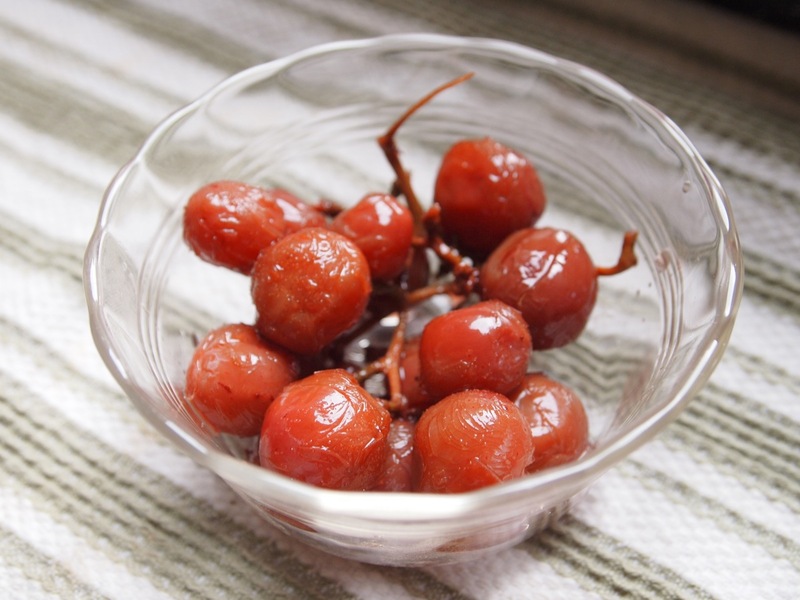 never heard of pickled grapes… i’ve had pickled plums from Taiwan, love them! maybe they’re similar? Wow! Pickled Grapes?!!? I would love to get to try those! I never had pickled grapes before…your dish looks interesting and photo is just beautiful! Congrats on blog award! This sounds both fantastic and amazing, Celia! You have got to make it for me. . . .